The School of Visual Arts and Design at UCF is a place for seeing, thinking, hearing, touching, learning, and creating. Art engages the senses and inspires the imagination and we designed our curriculum to do the same. We offer academic programs and courses of interest to artists and designers of all varieties. 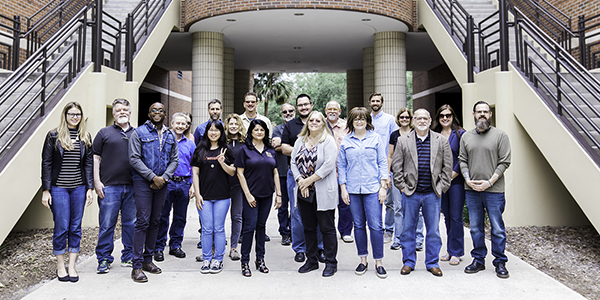 At SVAD, we have more than 50 faculty and staff advisors who are passionately dedicated to guiding you to the right course and career path. Our award-winning faculty is always ready and excited to spark your interest in whatever your career goals may be! Students interested in programs within the School of Visual Arts and Design are encouraged to tour our art studios and other computer labs. Tours are conducted by faculty and student ambassadors who are enrolled in a SVAD program. Tours are scheduled on Fridays (except for holidays) and depart from the School of Visual Arts and Design Advising Office in the Nicholson School of Communication Building, room 121. Large groups or schools should contact our office ahead of time to make arrangements. Students interested in touring the School of Visual Arts and Design are also encouraged to schedule an appointment to meet with an academic advisor. If you are unable to visit on a Friday, an appointment to meet with an academic advisor can be scheduled for a different day of the week. However, these appointments will not include a tour of our facilities. Currently, we do not offer tours of the Center for Emerging Media. We encourage prospective students and their families to attend “open to the public” events that occur throughout the semester for a chance to speak with faculty, current students and to see the facilities. The dates of these events can be found under News & Events. At the School of Visual Arts and Design (SVAD) we owe our successes in large part to the generous contributions of our alumni and friends who have supported our efforts. At SVAD within the College of Arts and Humanities, every gift has an impact that extends beyond the campus into our communities. We thank those who have invested in the college and inspired our students and faculty to pursue their academic and professional dreams. Please consider making a gift today or learn more about supporting our current scholarships.